For five years, drivers bumbled through Charles Circle like so many milling cattle - herded through tight spaces further narrowed by construction crews. Now that renovations are nearly complete at the MBTA's Charles/MGH Station and along Cambridge Street, shiny new signs direct motorists through the tangled intersection. And drivers are hitting the brakes trying to decipher what the signs mean. Welcome to the new Charles Circle, more confounding than the old. At the Longfellow Bridge and Storrow Drive ramps, signs explode with sprays of arrows that Back Bay resident Rob Henderson likens to a "fountain or a bouquet of flowers." Don't bother trying to match the four lines of directions to the four arrows; they all pertain to one. Another new sign on Cambridge Street is especially hard to read; the Massachusetts Highway Department planted a tree in front of it. This is a city whose winding streets are so legendarily hard to navigate that people cling to the myth that they were routed by cows. It's a region whose absence of street signs sends newcomers the clearest of messages: If you don't know where you're going, you shouldn't be here. Yet the transportation system has been substantially reshaped in recent years, from newly redesigned intersections such as Charles Circle to the engineering marvel of the Big Dig. 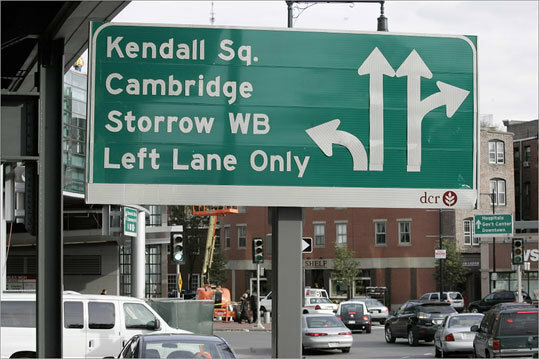 And engineers, given a golden opportunity to reverse the mistakes of the past, have only repeated them with signs that are confusing even battle-tested Boston drivers. "All the new signs that were placed when the Big Dig was completed are just as bad as the previous ones. In this day and age, wouldn't the engineers have learned better?" asked Alina Duckham of Newton, 46, an interior designer who works on Congress Street. Think fast if you're trying to get back on the highway from Albany Street. Signs direct you to the Turnpike (left) and Interstate 93 North (second left). They never mention the hard left that puts you on a 2-plus-mile no-exit odyssey to Logan International Airport - in a carpool lane. Last month, when the Massachusetts Turnpike Authority opened a new U-turn ramp for taxis and buses only, the signage was so unclear that unwitting drivers used it anyway and received traffic violations. A tractor-trailer that wasn't supposed to be there smashed 50 feet of new guardrail. "I scratch my head over who must do this stuff," said Elizabeth Reznick, an associate professor of graphic design at Massachusetts College of Art. "What we need to do as designers is be very simple, pare it down to its very essence and also market test it." The sign gurus at Massachusetts transportation agencies say they try to think like out-of-towners. "We sit around a table sometimes. I'll ask my wife, 'If you saw this sign, what would you do?' " said David Belanger, the Turnpike Authority's traffic engineer. "I try to get the public's perception of what it would be." This month, he changed a sign that was supposed to point from Kneeland Street to I-93 South via Albany Street; its arrow was leading drivers to turn too soon. "We got the first call, probably in June. So we went and looked at it. And every once in a while, you have to take it with a grain of salt . . . He's probably an irate driver," said Belanger. "Then we started getting complaints from residents on Marginal Road complaining because they say a lot of traffic is coming down that street and it's all because of that sign." The Turnpike Authority made adjustments six or eight months after putting the sign up, by Belanger's estimate. Belanger handles signs along the Mass. Pike and oversees Big Dig signage. Many Big Dig signs were designed by consultants, however. The disastrous signs on the turnpike's U-turn ramp went up on his watch but were ordered by his predecessor. MassHighway, which is in charge of most area highways, has four employees focused on sign and pavement marking, including Steve Timmins, a signage engineer. He will celebrate his 20th anniversary on the job next month. Before a sign goes up, Timmins reviews it with a design consultant, engineers in the local district, and in some cases the Federal Highway Administration. "It's not that one person has a final yes or no, but the decision is made collectively among those parties," Timmins said. Yet no one takes the wheel to ensure signage makes sense across the region. In fact, MassHighway has no jurisdiction over signs put up by the Department of Conservation and Recreation, another state agency that manages parkways, including Storrow Drive and the Longfellow Bridge. The ramps for those structures converge in Charles Circle, where DCR's turf collides with other agencies' boundaries and things get really interesting. In one small area, MassHighway is completing a $6.2 million reconstruction of Cambridge Street for the City of Boston, while, overhead, the Massachusetts Bay Transportation Authority is finishing a $37 million redesign of Charles/MGH Station. An MBTA consultant produced the signs at a cost of $80,000, roughly $2,000 apiece. But DCR dictated the design of the signs, the City of Boston reviewed them, and MassHighway - which had no say over the design - put them up. And then planted a tree in front of one. "There were multiple agencies involved in that project, and obviously, lines got crossed," said Mac Daniel, speaking for MassHighway. "We're working very hard to make sure that it doesn't happen again." In other areas, the problem isn't the signs; it's the lack of them. On Memorial Drive east in Cambridge, an unmarked ramp leads to the BU Bridge, taking only those-in-the-know to Boston University, Brookline, Fenway Park, or the Longwood medical area. In Kenmore Square, Beacon Street and Commonwealth Avenue illogically crisscross without the benefit of street signs, let alone a pointer to Fenway Park a block away. And the heavily traveled McGrath/O'Brien Highway divides in two, but there's no sign alerting drivers where the left lane leads - to the MBTA's Lechmere Station, the CambridgeSide Galleria mall, and the Middlesex County Courthouse. Since 2001, state Senator Patricia D. Jehlen has been sponsoring legislation that would force communities to post signs at intersections, but the bill has gone nowhere. The Massachusetts Municipal Association opposes it as a costly burden that takes the decision away from communities. Old habits die hard here, and drivers don't help matters with their stubborn affection for outdated names. Everyone, including traffic reporters, still calls the eastern section of highway from Canton to Braintree Route 128. Here's a news flash: The state designated it I-93 in 1989.
photos Do this, don't do that, can't you read the sign? Discuss Your pick for worst sign in Boston?